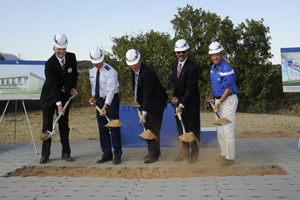 U.S. AIR FORCE ACADEMY, Colo. - The dream became a reality as the USAFA Endowment, on behalf of the United States Air Force Academy and the Association of Graduates, hosted a groundbreaking ceremony for the new Holaday Athletic Center on October 1, 2010. The project was made possible by a generous lead gift of $5 million from Bart and Lynn Holaday, Class of 1965—the largest gift from a graduate to the Academy in the institution's history. The Holaday Athletic Center, an indoor athletic training facility, is also unique in that it is the largest privately funded capital project in Academy history. Construction is slated to begin this month and be completed by the start of the 2011 academic year. The 94,000 square-foot center will house a regulation-sized field that can accommodate lacrosse, soccer and football, in addition to many other cadet activities. Cadet athletic development and performance will be enhanced through reduced weather delays, increased training time and improved replication of game conditions that the facility provides. 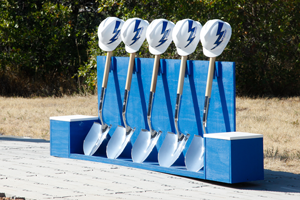 To view more photos of the groundbreaking ceremony visit our photo gallery.